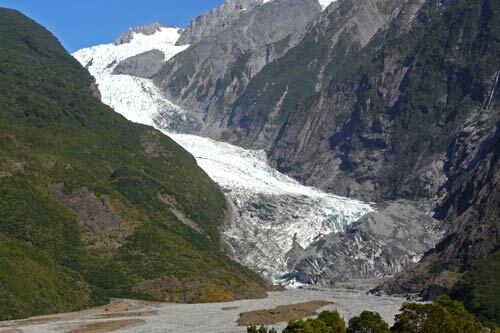 Travellers to South Westland can get close to two major glaciers – Franz Josef and Fox. This view of the Franz Josef Glacier, taken in early 2008 from Sentinel Rock, shows how the glacier descends down a very steep valley from its névé (source area) in the mountains to low altitude. The front (or snout) of the glacier is surrounded by native forest. In the past, when the glacier has advanced, it has actually pushed trees over.